Celadon City lies to the west, past Saffron City. Once again, the road through Saffron City is blocked, but after fighting your way through a number of would-be Pokémon masters, you'll be able to use another underground path to bypass the guardhouse and reach the road beyond. Why is Saffron City locked up so tight? That's yet another mystery for another day. You'll need to go west to a big city named Celadon City. While there might be a bunch of trainers blocking your way in Route 8 (including that ridiculous four trainer line in the middle of the route), nearly all of them can be easily avoided and you only need to fight one of them (Trainers #1 and #2 at the very east of Route 8, you have to fight at least one of those two). Note: The #8 Gambler on Route #8 is crucial to the performance of the second method of the Mew glitch and should not be challenged until you are ready to perform the glitch. The many roads to Saffron City are all blocked, so once you pass the challengers and catch yourself a Pokémon or two, take the tunnel connecting Routes #7 & #8. You never know what people may have misplaced in the dim lighting of the underground path. Your Itemfinder will tell you if something's nearby, so take the time to explore a bit--there's an excellent chance you may find something valuable, like an Elixir (bottom row, nineteen tiles east of the Route 7 stairway) and a Nugget (second row, thirty-five tiles west of the Route 8 stairway). 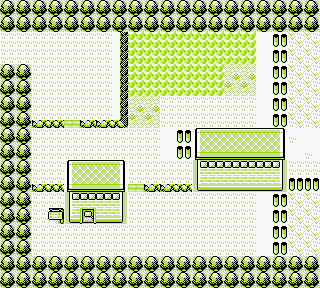 The Underground path takes you to Route #7, which leads straight into Celadon City. This booming metropolis has everything a Pokémon collector might need, from a Department Store (a much bigger Poké Mart) to a Game Corner for entertainment. If you've got the time to spare and want to build up your team, there's a wealth of Pokémon hiding in the tall grass just outside the city. This is also your chance to get a Fire-type Pokémon if you need one on your team (although it might not be so strong for much of your in-game), Growlithe for Red version, and Vulpix for Blue version. Every road leading into Saffron City is blocked, and no one seems to know why. Are the guards posted at the gates to keep people in or out? What's being hidden? In any case, all the guards are quite thirsty. Perhaps there's something in Celadon City that could help in this situation. Fire Pokémon abound around here... Red players can get a powerful Growlithe, a tough fighter with decent Fire attacks and good attacking stats, who turns into one of Red's toughest brawlers when you power him up (into Arcanine) with a Fire Stone. But you may want to wait on that until it learns the very powerful Fire-type attack, Flamethrower, at level 50, which is pretty far. Blue players can get the nine-tailed firefox Vulpix, like Growlithe, evolves into its final form with the aid of a Fire Stone. Vulpixes may not be as offensively tough as Growlithe, but they are a bit quicker, and they learn a good move for trapping (Fire Spin, the Fire version of Wrap) as soon as level 42. Use the Fire Stone then and you'll have a tough and versatile, good all around Ninetales, but you might want to gain its level-up moves as a Vulpix first. This page has been accessed 806,775 times.